I don’t know about you, but in my line of work, I often find myself off the beaten path in the middle of nowhere. In times like these it’s super helpful to have maps that I can still reference, even without an active internet connection. Â For the most part, if you don’t already have the poor coverage area pre-loaded in your map program, you won’t have the ability to interact with the map. Â This can be a huge inconvenience when I am trying to pin-point specific particular lat & long coordinates. I really wanted to be able to accomplish this in Apple Maps. Â However, after some searching around, I just couldn’t figure out how to make it happen, nor could I determine if it is even a possibility. Â No worries, though, Google Maps is a perfectly good alternative, and even a preference for many iPhone users. 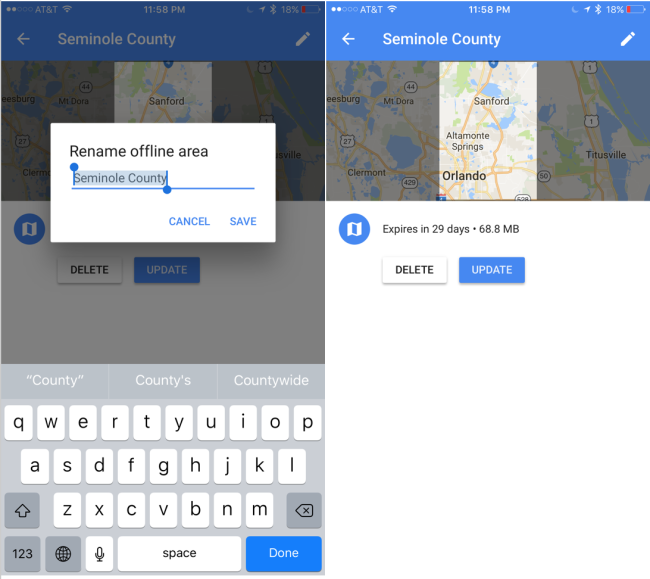 To create an offline Google map on your iPhone Â first–launch Google maps. Â Next, in your current location view, click on the three stacked lines in the upper left corner. Â This will open your map settings where you will be able to select Offline areas. Â Once opened, any saved offline maps will be listed. Â When you scroll to the bottom of your list (if you even have any saved locations) you will see the option to download an offline area. Â Just below that you will see an option to create a custom area. Once selected, you can zoom out to capture the maximum extent of the content you wish to save in your view. The farther you zoom out, the greater amount of storage you will consume to same your offline map. 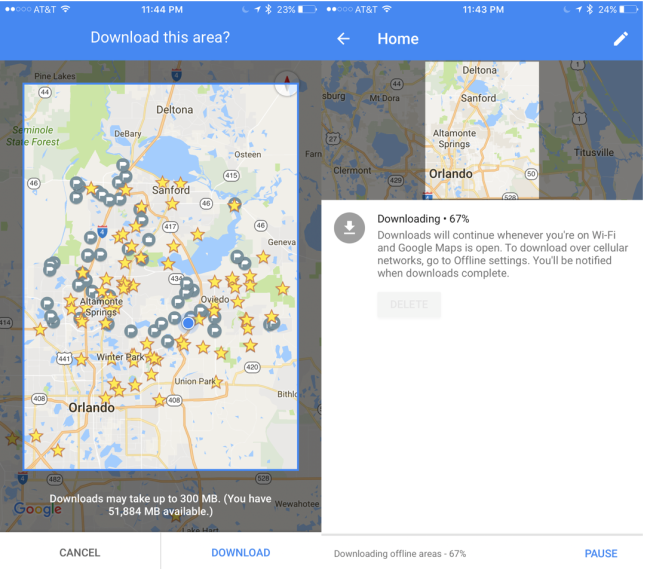 Â There will be a running tab at the bottom of the page indicating how big the current view would be to save, and how much storage you currently have available on your iPhone.Â After you have the area you wish to save as an offline map–select download, to create a new map. Â After the map is downloaded you can rename the map with the edit tool. 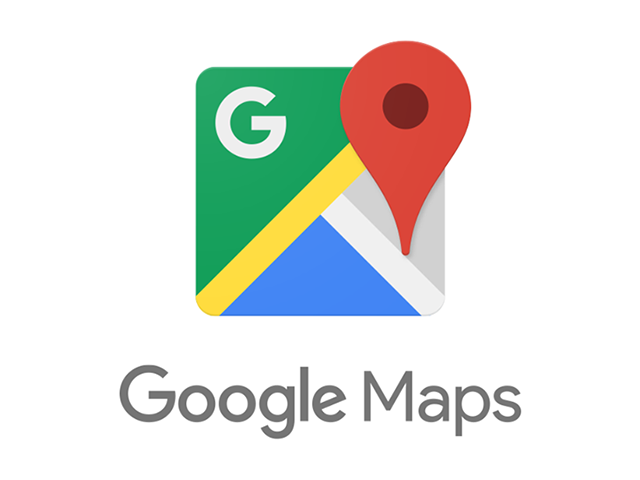 As an added bonus, you can choose to have Google prompt you to update your map ~once/month–which is especially nice to keep track in areas of more active development and sprawl, or you can do it manually. 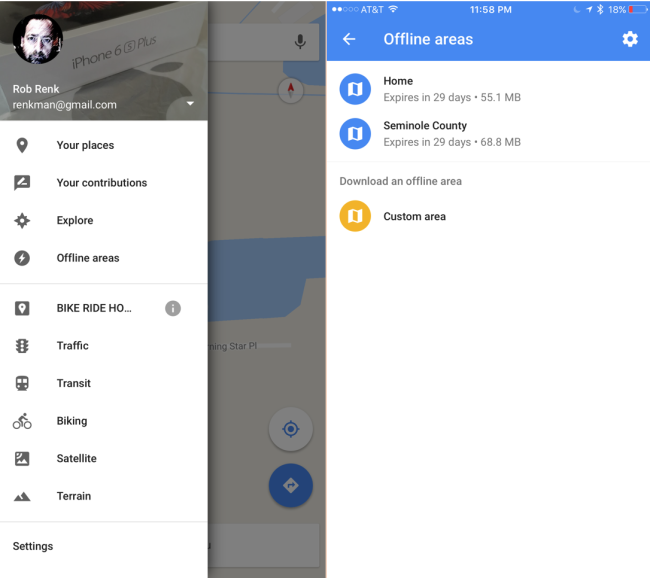 Â In addition, you can also select to have the offline maps only update when you are on Wi-Fi Â Of note, though, the offline maps that you create and save are a “snapshot” of sorts, and by definition cannot be searched or used for directional instruction. Â You can, however, still pan and zoom around the map–which, for me, is the most important feature I use anyway.